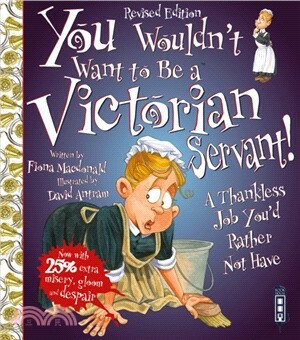 You Wouldn't Want To Be A Victorian Servant! Get ready... as a 12-year-old girl living in Britain in the 1880s, you are about to start work for a wealthy family. You will be busy all day long as a Victorian servant. This title can be used as a background approach to wider issues in Victorian times, such as class divides, daily life and the position of men and women. The humorous illustrations make learning fun, and encourage young readers to engage with the central servant character. Informative captions, a glossary and an index make this title an ideal and fun introduction to the conventions of non-fiction text. It is relevant to Key Stage 2 history and helps to achieve the goals of the Scottish Standard Curriculum 5-14.